Have you ever felt like a stranger, in a foreign land or in your own skin? This mixed media art quilt explores some of those feelings. The fabrics are bright and full of energy. The design swirls in elliptical patterns. With the initial look, its brightness and swirling shapes pulse with energy. The original piece of fabric was heavy weight printed cotton created for costumes for the 2006 Carnival in Salvador, Brazil. The bright colored fabrics convey the excitement of Carnival time and parallel the energy of the drummers. Their rhythmic music was vital and energized. 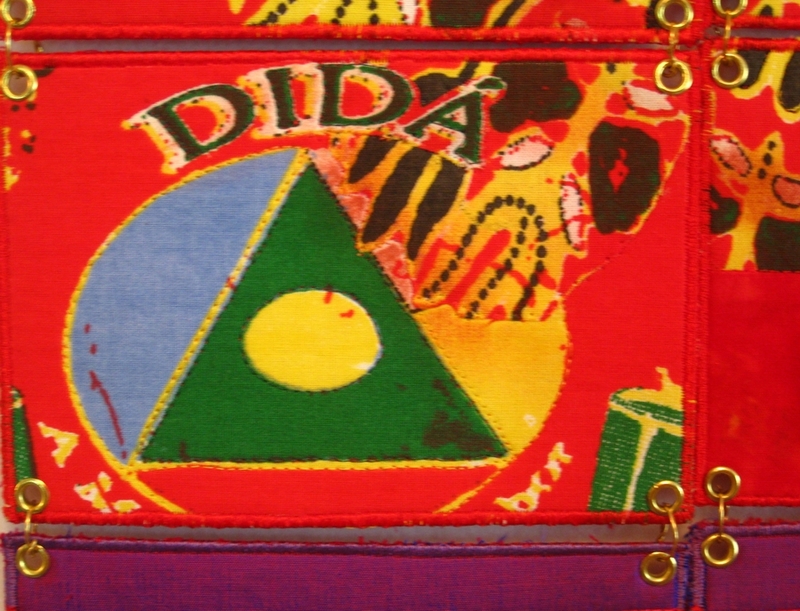 Dida printed across the top of the art quilt is the name of the performing group of women drummers who wore the brightly colored costumes. The fabrics cut into 4” x 6” postcard sized shapes for this art quilt become reunited with the grommets and the wire. This gives an image of cutting apart and coming back together. It could further reinforce that feeling of being separate, being a stranger. 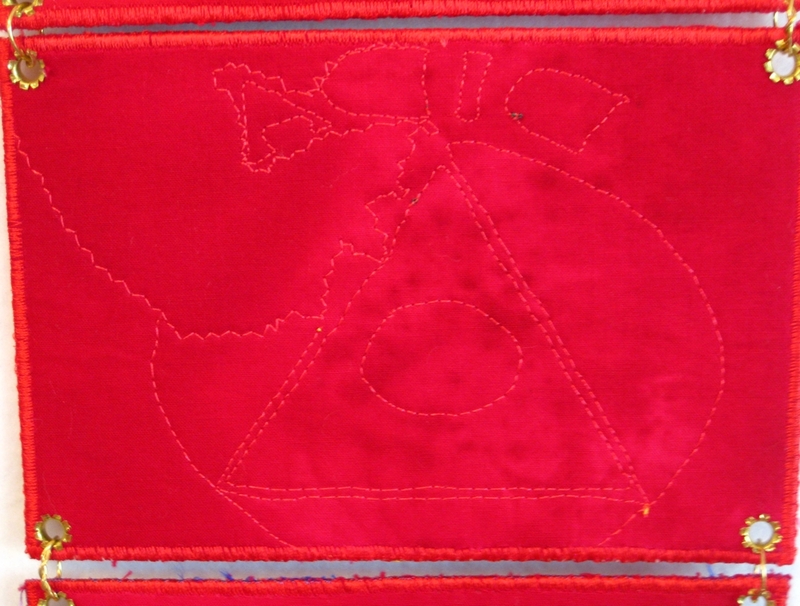 Everything appears well put together with color and stitches, and yet, is it? 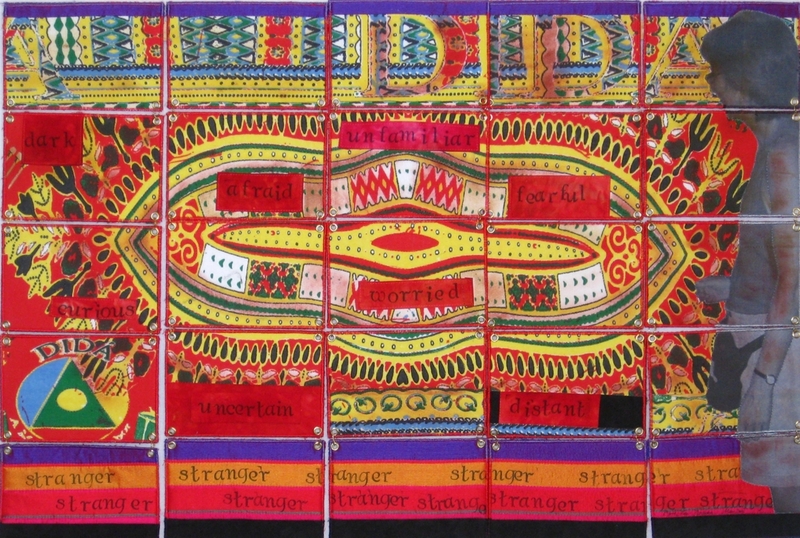 The words stamped at the bottom striping say “stranger”, “stra nger”, “strang er” echoing out the word. Toward the center of the elliptical energy are other words that may rise up when a person is faced with the unknown. The haunting feeling is just below the surface—is it real? Is it imagined? A woman was a stranger in another culture. Real or imaged thoughts, she felt unsure about how to behave and unsure of the ways of a foreign culture. 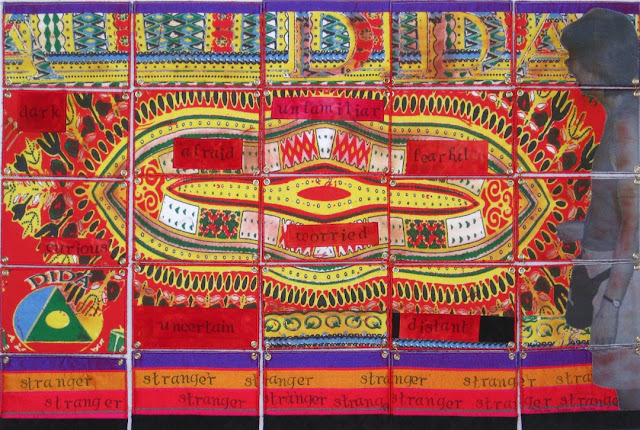 There is a juxtaposed energy with the brightness of color and the undercurrent of separateness and being a stranger giving a push and pull within this art quilt. How do the energies of familiar and unfamiliar or new come together? Can they co-exist? Can unfamiliar be positive? Have you felt like a stranger? And if so, how have you come to a new place within yourself to bring the familiar home to your heart? See more details about She, the Stranger in the Gallery.